Other protesters held a banner which read ‘Stop the Destruction’ and advertised the 2008 Saving Iceland protest camp, which will begin on the 12th of July. Two protesters were arrested and released without charge when the ceremony was over. 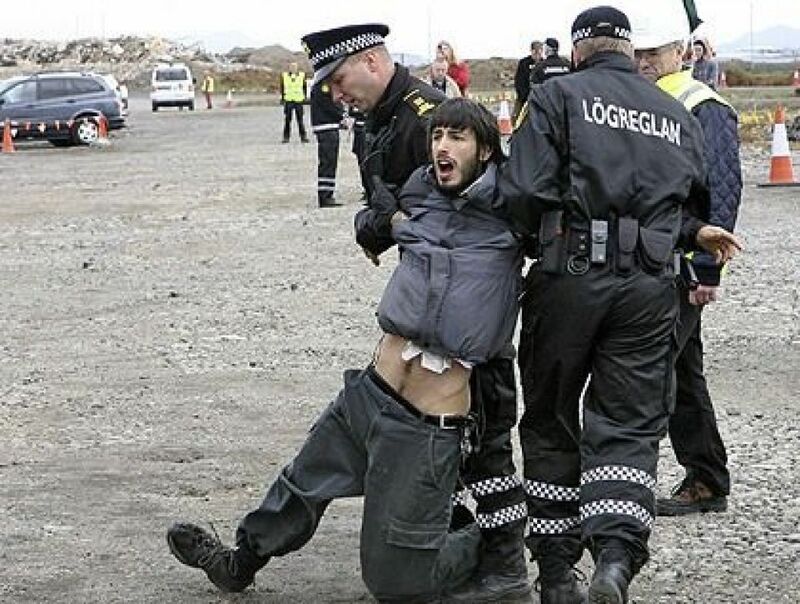 Once again the Icelandic police arrested protesters without them having done anything illegal; simply to silence them. The Icelandic media was quite critical about the ceremony, for good reason. Asked about the contracts for the energy smelters energy resources, Ragnar Guðmundsson, the director of Century, said he hoped that those things will be sorted when the first part of the smelter will be ready in late 2010. Árni Sigfússon, major of Reykjanesbær town, said he could imagine that contracts for the power lines would be made in less than two months and Guðumundsson added that Century would apply for their greenhouse gas (GHG) emission quota in the beginning of July and that Century still has not been awarded permission to operate a new smelter. This is a typical strategy for the heavy industry projects here in Iceland. Big companies just go ahead and start their construction without proper permissions, believing that once they have a completed building no organization would refuse to let them begin production. For why should an already made aluminium smelter be left empty? Last year, Century applied for GHG emission permission but was refused by Þórunn Sveinbjarnardótir, the Minister for Environment. This being the case there should be no reason for her to award Century the permission now when the only change in circumstance is that they have started building their smelter. Century has made contracts with Reykjavík Energy (OR) and Hitaveita Suðurnesja about energy acquisition for the smelter but where will the energy be coming from? Geothermal spots in the Reykjanes penninsula are on the map, for example in Krýsuvík, Trölladyngja and Sandfell, but the possible constructions there have yet to go through their Environmental Impact Assessment (EIA) phase. Just recently a planed geothermal plant in Bitra (in the Hengill area) was put on hold and therefor Reykjavík Energy does not have many possible energy sources for Century. So we ask again: Where will the energy be coming from? Could it be that the national power company Landsvirkjun’s planed dams in the lower Thjórsá River will become necessary, despite unanimous opposition by those it would directly affect? And will the Minister of Industry, Össur Skarphéðinsson, allow Landsvirkjun to use forced expropriations against the farmers by Thjórsá? Whatever the outcome will be, it is clear that the whole process of the Helguvík smelter project is heavily corrupt and will demand that more unique areas in Iceland will be destroyed for the greed of the aluminum industry. It is in our hands to stop this corruption. The fourth protest camp of Saving Iceland starts on the 12th of July – Join us! *London based Indian mining corporation Vedanta (Sterlite) is pursuing a plan formed by Alcan to mine a set of forested bauxite hills in Orissa, India, which will clearly lead to cultural genocide of thousands of indigenous people. See the essays by Samarendra Das and Felix Patel here on this website.